This recipe is super simple and great for parties, snacks, or a quick dinner! Anything Pizza”ish” is always a hit at our household. Plus, it’s super customizable if you want to add mushrooms, sausage, or other pizza toppings! You can even make vegetarian by simply substituting the meat for spinach. This is also great to use up that leftover pasta sauce! All you really need is mozzarella cheese, pizza sauce, pepperoni, and a roll of refrigerated pizza dough. Roll it out flat. Add about 1/2 cup of pizza sauce. Layer the pepperoni. Roll from end to end into a loaf. Brush with melted butter and sprinkle with parmesan cheese. Bake at 375 degrees for about 15-20 minutes until dough is done! Slice when done! I made these for a Christmas party this past year and they were a huge hit! 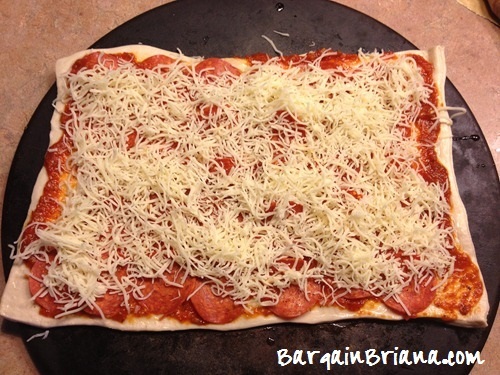 Roll refrigerated pizza dough out flat..
Add about ½ cup of pizza sauce. 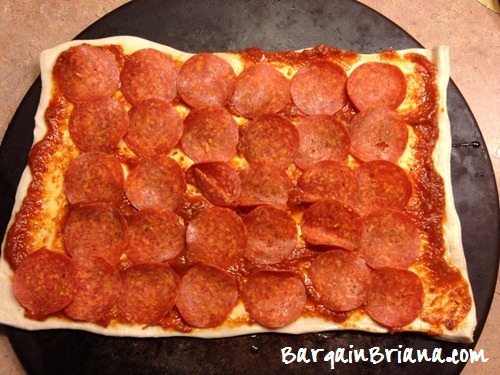 Layer the pepperoni. Roll from end to end into a loaf. Brush with melted butter and sprinkle with parmesan cheese. Bake at 375 degrees for about 15-20 minutes until dough is done!